This cosy shawl is an asymmetric triangular shawl knitted from the tip to the broad edge. 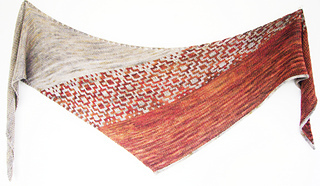 It uses two skeins of contrasting colours and features a mosaic section that transitions the two colours. If you have never tried mosaic knitting before it’s super simple and I’m now addicted to the beautiful patterns it creates. Essentially it’s just like knitting stripes, you use one colour at a time, and knit one right side and one wrong side row before swapping to the other colour for another two rows. The amazing pattern effect is achieved by slipping some of the stitches. It’s as simple as that! Prefer to knit with sock weight yarns? Suitable for adventurous beginners, intermediates and experts alike. Gauge is not important but about 18 sts and 24 rows on a 5 mm (US 8) needle in garter st. A different gauge will affect the finished size of the shawl. MC: ~240m DK weight yarn. CC: 240m DK weight yarn. 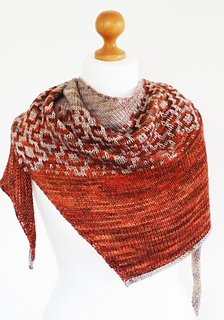 A note on yarn choice: use very contrasting yarns. Best suited to either two solid colours or one solid and one variegated that has no colours in it that are the same as the solid contrast yarn. You must be able to knit, purl, kfb, kfbf, slip stitches i-cord. The mosaic section has both full written instructions and a chart if you prefer.